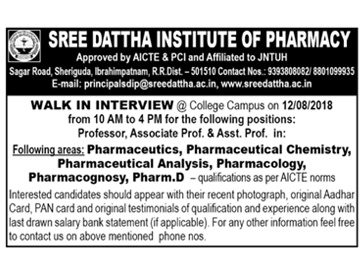 Sree Dattha Institute of Pharmacy, Ranga Reddy has advertised in the DECCAN CHRONICLE newspaper for recruitment of Professor / Associate Professor / Assistant Professor jobs vacancies. Interested and eligible job aspirants are requested to walk-in on 13th August 2018. Check out further more details below. About College: Sree Dattha Institute of Pharmacy, founded in 2005 under the aegis of Vyjayanthi Educational Society, represents a rich tradition of excellence in pharmaceutical sciences based education. A premier-league institution among the affiliates of JNTUH under SreeDattha Institutions owes its vision to Sri G. Panduranga Reddy, the Chairman of our institutions. How to apply: Interested and eligible candidates are requested to attend the Walk-in interview along with passport size photograph, original Aadhaar card, original PAN card, original testimonials of qualifications and experience and last salary drawn bank statement (if applicable) to the following walk-in address.